Mr. Bear reads "Your Possession" from Goddessmode on Mr. Bear's Violet Hour Saloon "Fun and Games" episode, August 2015. Michael Alexander Chaney included thoughts from me on First Flash Publications, December 2013. Michael Alexander Chaney mentioned "The Hermitage" in his blog post about surreal flash fiction, September 2013. Michael Alexander Chaney mentioned "Snorkeling" in his blog post discussing Short, Fast, and Deadly, August 2013. 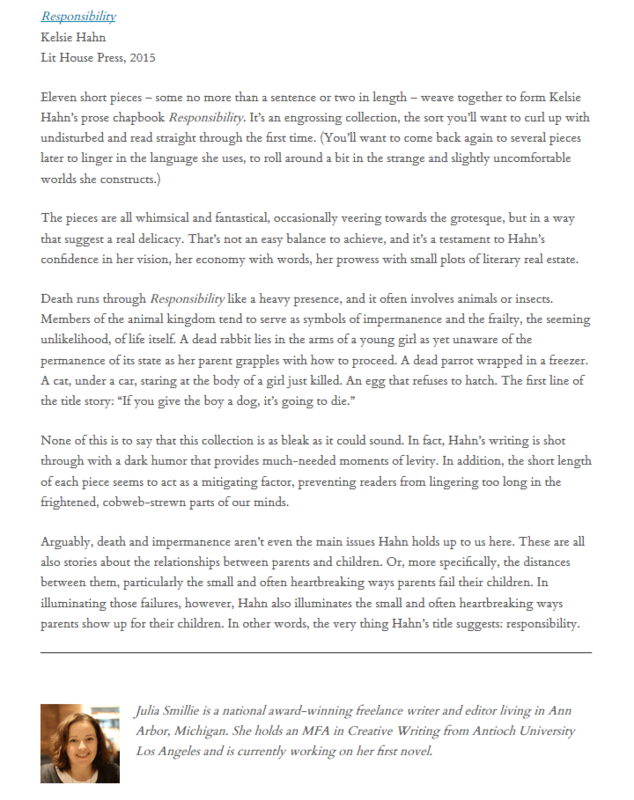 "Responsibility," reviewed by Julie Smillie at Rhizomatic Ideas, September 2015. "Three Questions with Kelsie Hahn," Extract(s): Daily Dose of Lit, January 2015. ​"Twelve Days of Giving Reason Six: NANO was My First Publication - Kelsie Hahn," NANO Fiction, December 2014. ​"Writer/Gamer Q&A: Kelsie Hahn," Cartridge Lit, September 2014. ​Nominated by Jellyfish Review for "Offspring"
Awarded for "Last Days of the Microsaurs"
Nominated by Sundog Lit for "The Evidence of Where We No Longer Live"
Awarded for "Last Days of the Microsaur"
Nominated for a Pushcart Prize in 2014. Nominated by NonBinary Review for "Ilsibill in the Night, Alone"
Awarded for Responsibility, a small collection of flash fiction. Awarded for "Looking." Judged by Timothy Schaffert. Nominated by Jersey Devil Press for "The Hermitage." Nominated by Matchbook for "A Good, Clean Shot." Awarded for the short short "What My Daughter is Holding." Judged by Robert Olen Butler. Awarded to an English graduate student to fund work for research-based or creative projects. Awarded for research costs for the paper "'Better a Rich Cripple': Situating Disability Models in 'A Song of Ice and Fire' and 'Game of Thrones.'" Awarded to a second-year NMSU MFA graduate student for excellence in service to the creative writing program. Awarded for work on the literary journal Puerto del Sol and with Writers in the Schools. Awarded for a graduate work of literary criticism during the 2010-2011 academic year at NMSU. Awarded for “Kindling,” included publication in Glass Mountain. Awarded for “Certifiable,” included publication in Glass Mountain.